*Facultad de Ingeniería, Escuela de Ingeniería Química, Universidad de los Andes, Venezuela. **Laboratorio FIRP, Escuela de Ingenieria Quimica, Facultad de Ingenieria, Universidad de los Andes, Venezuela. ***Escuela Basica, Facultad de Ingenieria, Universidad de Los Andes, Venezuela. ****Laboratorio FIRP, Escuela de Ingenieria Quimica, Facultad de Ingenieria, Universidad de los Andes, Venezuela. This paper builds on a project-based engineering learning strategy called RAIS ‘Reproducing an Innovation Environment in the Classroom’ applied in courses in the Chemical Engineering curriculum at the Universidad de Los Andes (ULA). It follows a previous investigation where the practical implementation of RAIS strategy is presented (Marquez et al., 2016), and in this occasion the theoretical fundamentals of the RAIS strategy are outlined. Authors take the common project-based learning to a new level by directly involving the students in the common start-up company practice, where the final product to be formulated and manufactured is not a requirement from an external client, but comes from real entrepreneurship students’ interests. In previous work it has been shown that this strategy allows interconnecting the course objectives with the development of a product. RAIS strategy has reported successful outcomes in the accomplishment of this goal for Chemical Engineering students at ULA. Este trabajo se basa en la estrategia de aprendizaje de ingeniería basada en proyectos llamada RAIS ‘Reproducción de un Ambiente de Innovación en el Salón de clase’ aplicada en cursos del plan de estudios de Ingeniería Química de la Universidad de Los Andes (ULA). Ésta es una continuación de una investigación previa donde se presenta la implementación práctica de la estrategia RAIS, y en esta ocasión se explican los fundamentos teóricos de la estrategia RAIS. Los autores llevan el aprendizaje común basado en proyectos a un nuevo nivel al involucrar directamente a los estudiantes en la práctica común de creación de nuevas empresas, donde el producto final a ser formulado y fabricado no es un requisito de un cliente externo, sino que proviene de intereses reales de estudiantes. En trabajos anteriores se ha mostrado que esta estrategia permite interconectar los objetivos del curso con el desarrollo de un producto. Además, la estrategia RAIS ha reportado resultados exitosos en el logro de ésta meta para estudiantes de Ingeniería Química en la ULA. Nowadays, it is well known that engineering and technology have contributed to the transformation of the world we live in, having a central role in human progress. International organizations such as UNESCO and its collaborators support this new perspective on the engineer’s role in development in a landmark report (UNESCO, 2010) and through the goals established by the new 2030 Agenda for Sustainable Development (UNESCO, 2017). The former report called for a change in Engineering Education, identifying four broad skills categories that should characterize an engineering professional: technical, personal, professional and management, all this in accordance with the three faceted engineer’s profile: designer, researcher and (technical) manager (de Graaff and Ravesteijn, 2001). The UNESCO 2030 Agenda openly recognizes Science, Technology and Innovation (STI) as ‘key drivers for sustainable development’ promoting ‘sustainable economic development, entrepreneurship and youth employability’. In order to fulfill the present and future goals for sustainable development and as far as engineering education is concerned, it is mandatory to transform our conception and practices of teaching and learning. For the purpose of approaching this challenge, engineering education must simultaneously work on two complementary tasks: the definition of the skills and competences for graduating engineers (de Graaff and Ravesteijn 2001; Crawley et al., 2011) and the development of effective teaching methods that help to reduce the gap between knowledge and action (Mills and Treagust, 2003; Prince and Felder, 2006; Mäkimurto-Koivumaa and Belt, 2016). Understanding this action, not only as the application of engineering and multidisciplinary knowledge, procedures and techniques to solve particular and new problems but also as the demonstration of a wide variety of skills: communication and presentation skills, project management and research skills, entrepreneurship mindset, team work skills, social and strategic thinking skills, and time management. This paper builds on project-based engineering learning as one of the most commonly alternative inductive teaching approaches (Prince and Felder, 2006) and takes it to a new level by directly involving the students in the common start-up company practice, where the final product to be designed and manufactured is not a requirement from an external client but comes from real entrepreneurship students’ interests. The purpose of the present work is to contribute to the development, application and thought of new teaching methodologies for applied sciences, such as engineering, by applying a teaching strategy designed on the basis of distributed cognition theory (Perkins, 1992), social constructivism and entrepreneurial practices typical of start-up companies. These different theories and practices are amalgamated in what could be called entrepreneurship project assisted learning and what the authors have called RAIS (Reproduction of an Innovation Environment in the Classroom). An example of using entrepreneurship project assisted learning has been the teaching of some courses of Chemical Engineering students at the Universidad de Los Andes (ULA), Mérida, Venezuela (Márquez et al., 2016). The paper proceeds as follows. Firstly, the background literature in the areas of constructivist theories of learning and distributed cognition, which lead to the alternative approaches in engineering education such as problem- and project-based learning will be presented. These topics are followed by a consideration of the new trend in entrepreneurship training in engineering education. All this background represents the theoretical foundations of our methodology applied in Chemical Engineering (Márquez et al., 2016; Márquez et al., 2017). Developments in the fields of psychology of learning, educational philosophy, technology, and entrepreneurship practices have increasingly been coupled as far as engineering teaching and learning strategies is concerned. Under the lenses of constructivist theory, knowledge is viewed as the constructive process rather than just a finding or a final result. The understandings of that process of construction have been enriched by the different learning theories. It may have initially been influenced by Piagetian cognitive developmental approach, emphasizing the individual re-organization and equilibration process of mental structure (Piaget, 1977). The socio-cultural approach based to a great extend on the ideas of Vygotsky (1978) has contributed to develop more contextualized understanding of knowledge, as the internal re-construction and appropriation of external and social meanings. While Piagetian approach deal with individual cognitive process, Vygotsky contribution emphasizes the social and collaborative interactions in the construction of shared knowledge. The surround-the immediate physical, social, and symbolic resources outside of the person-participates in cognition, not just as a source of input and receiver of output but as a vehicle of thought. Physical distribution of cognition in the learning process not only consists in the use of varied formats of input - texts, lectures, films, and so on, but also in different ways of presenting what students say, write and learn (learning journals; portfolios; and process-folio) (Gardner 1989). Social distribution deals more in detail with the activities and different interactions that could take place in learning environments when working together configurations are set up. Damon and Phelps (1989) wrote of ‘peer-education’ as a category that includes peer tutoring, cooperative learning, and peer collaboration. They highlighted two dimensions of importance when comparing their contribution to good learning: equality and mutuality. Equality refers to the equal status of the participants instead of the hierarchy in a typical teacher/student relationship, while mutuality talks about the extent the discourse among learners is connected, extensive and intimate. On this basis, learning environments based upon activities ranked high on equality and mutuality serve better for the purpose of learning. This is the case of collaborative learning that seems to be the most often configuration in project-based learning, which we talk on later in this literature review. On the other hand, symbol systems of various kinds: words, equations, tables, diagrams, images - are the common medium of exchange among people. In order to distribute cognition symbolically is necessary to use those different symbol systems in all kind of subject matters without straitening one particular symbol system to a particular subject (e.g. written practices only for humanistic disciplines). The person-plus phenomenon allows to understand the role of technologies in learning, as part of the surround that could be used and created by the learner. Salomon et al. (1991) identified the effects with and of technology, including computers but also such ordinary technologies as paper and pencil. What it is learned and remains in the mind and surround of the learner belongs to the effect of, while the empowerment and capacities that results when the technology is being used refers to the effect with. Novel constructivist strategies more often include activities and tasks that support on technology. Bearing in mind both effects with and effects of could enhance the learning opportunity and the person-plus cognition of the strategy implemented. The distribution of cognition may be encountered in a variety of educational approaches. Problem- and project-based learning are two of the common methodologies that have now been applied since their beginnings in the Aalborg University Model at the early 1970’s (Kolmos, 1996). Problem- and project-based learning are based on three learning principles (de Graaff and Kolmos, 2003): the cognitive learning, the contents, and the social approaches (Lehmann et al., 2008), that may be understood from the distributed cognition perspective. Some important reviews such as those of Mills and Treagust (2003) and Prince and Felder (2006) discussing the different learning methods including problem- and project-based learning, highlighting commonalities and specific contrasts, and research on the effectiveness of the methods. One of the most common conclusions in this field is that engineer’s education needs to allow interactions, diversity and searching skills for information. Project-based learning appears to be the best way to fulfill industry needs and satisfy, at the same time, the requirements of knowledge of engineering fundamentals (Álvarez-Borroto et al., 2017). Another framework component of our learning approach has to do with the industries’ needs as well as the global management of economic development. Both aspects are now closely related to engineering education (UNESCO, 2010) stressing the importance of an entrepreneurship mindset in engineering graduates. Initial entrepreneurship definitions described it as an opportunity discovery where the entrepreneur first defined the goal and thereafter figure out the means to get there (causation perspective). This definition has evolved to consider entrepreneurship as an opportunity creation where effectuation is more often used by expert entrepreneurs instead of causation. In effectuation, entrepreneurs do not start defining the goals but rather they start with given means (resources, personal competences and skills, networks of partners) that lead to different goals to develop over time (Mäkimurto-Koivumaa and Belt, 2016). According to recent research work (Luryi et al., 2007; Costello 2016) more engineering programs are including learning environments that enable experimenting with entrepreneurial behavior. The highest goal being: learning to see life as a creation process. RAIS stands for ‘Reproducción de un Ambiente de Innovación en el Salón de clases’ (Reproduction of an Innovation Environment in the Classroom). It is a learning strategy that seeks to integrate constructivist learning theories, and project based learning on the basis of cooperative and collaborative learning, with the reproduction of an entrepreneurial scenario (Sandia et al., 2011a). It is a didactic proposal developed at the Faculty of Engineering of the ULA, oriented to transform the traditional process of teaching and learning, based on the explanation and transfer of knowledge, in a process based on the application and the integral and pertinent management of knowledge. RAIS shares its fundamental goal of developing professional skills through the learning processes that are similar to those of authentic engineering practice, with models that propose a reform of engineering education, such as Problem / Project Based Learning (Fernández and Aguado, 2017), CDIO: Conceive-Design-Implement-Operate (Edström and Kolmos, 2014) and simulation-action learning recently proposed (Costello, 2016). RAIS proposes the incorporation of activities for the formation of competences related to creativity and entrepreneurship in the teaching-learning process, which contribute to develop a favorable attitude and a disposition to learn, fostering academic success and the achievement of comprehensive vocational training. The RAIS strategy has been used in different courses and subjects of different engineering careers. The published works (Sandia et al. 2011a, 2011b; Gutiérrez et al., 2015; Márquez et al., 2016) are an excellent example of the variety of proposals that can be made and of the flexibility of adequacy and application. RAIS is based on the productive and effective working environment characteristic of an entrepreneurial setting. The strategy transforms the classroom into a set of start-ups, aimed at generating a final product. The development of the selected product requires the study, understanding, integration and application of a wide range of knowledge and their intrinsic relationships, where both the knowledge inherent in the subject that the students are taking, as well as those that allow the successful execution of the project are taken into account. In this sense, RAIS becomes an effective platform to implement the integration of knowledge and disciplines to develop a product. The RAIS strategy is based on three fundamentals components (Sandia et al., 2011a): the knowledge training synergy (SCC), the product development synergy (SDP), and the product. These components are framed in the context of the reproduction of the industrial environment in the classroom. Figure 1 shows the RAIS components and its gears. Figure 1 RAIS components and gears. The Knowledge training synergy (SCC) seeks to fill the cognitive requirements necessary for the product development in the class. The SCC allows students to be guided towards theoretical and practical knowledge that should be covered according to the syllabus of the course, serving as the fundamentals for the product development synergy. From the perspective of knowledge, the SCC includes the teacher’s view, the view of the different sources of information (technological devices, Internet, etc.) and the view that the same student is incrementally acquiring throughout the development of the product. The Product development synergy (SDP) main objective is to capitalize on the effort within the classroom to lay the foundations of the start-up environment, help and support the student in product development, as well as follow up on its progress throughout the study period. The SDP allows the management of the course knowledge detecting faults and gaps in the student’s formation that are covered in the SCC. The time available for the SDP simulates the entrepreneurial environment, to discuss particular aspects of the product that is being developed, generate and promote discussion of ideas inside the working groups (denominated companies), clarify doubts or solve technical problems that arise, as well as work on the product under the management of the teacher, who becomes the Chief Executive of all companies. The Product is an object of tangible and intangible attributions, is a good, a service, a place, an idea, a result, which brings benefits and satisfaction to an individual or society. In RAIS, the product is the result of student performance in the classroom. The RAIS product covers the essence of the programmatic content and allows the achievement of the objectives, as well as the development of skills and abilities of the course. The product is the centre of RAIS strategy, its development and execution is the main course goal. In general, the product to be developed in a RAIS course, must meet the characteristics shown in Figure 2. Figure 2 Characteristics of the product for RAIS strategy. How is RAIS being implemented for teaching in chemical engineering? One of the advantages of the RAIS strategy is that, despite the key and indispensable components necessary for its implementation, and therefore, to ensure the achievement of the objectives, RAIS is a flexible and adaptable strategy, for both the requirements and curricular conditions of the course and the characteristics of the group of students (interests, previous knowledge, expectations, availability of time and resources, ease of access to information, among others). 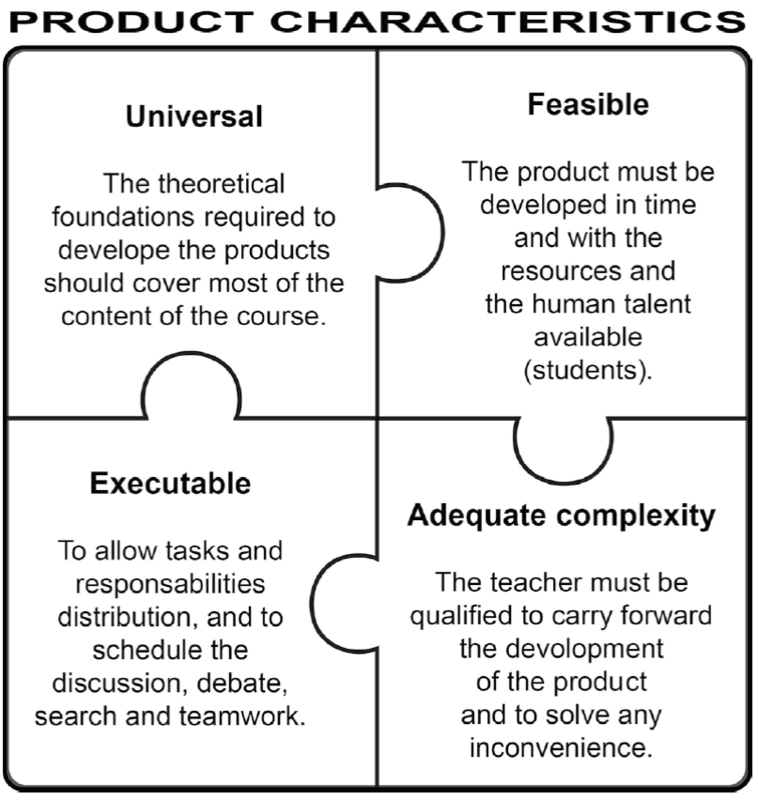 Thus, every RAIS course is based on the following components or steps: establishing clear teaching-learning objectives, organization of the set of companies (work teams), selection of the products to be developed, definition of roles and functions to be fulfilled by both students and the teacher, scheduling activities (product execution plan), meetings and partial reports, and specifying the strategies that will be used for formative and summative evaluation of the process (see Figure 3). Figure 3 Basic steps of the RAIS strategy. •Different products per company, proposed by the students. Unlike previous experiences (Sandia et al., 2011b; Gutierrez et al., 2015), for the courses Physical Chemistry for Chemical Engineers and Laboratory of Industrial Chemistry, each company proposed several possible products to be developed. With the guidance of the teacher, the students had to select the one that allowed the most optimal fulfillment of the cognitive, procedural and attitudinal objectives proposed. The participation of the students in this stage, promotes two important aspects of education theory. The first one is related to the diagnosis, a primary educational element in educational planning (Díaz Barriga and Hernández, 2002), which allowed the curricular content to adapt to the interests and needs of the young people. From the constructivist approaches (Bruner, 1959) and cognitive theory (Ausubel, 1963; Ausubel et al., 1978), diagnosis is essential for the construction of knowledge and the acquisition of meaning to accomplish integration between the new information and pre-existing conceptual structures. Besides, it allows the activation of previous knowledge, coupled with the search for related and relevant information. The second aspect refers to that search of information that counts for the distributed nature of cognition. RAIS enables students to think and to acquire skills of intelligently handling information, instead of drown them in it. Salomon (1998) comments on a change of the meaning of knowledge that has been attributed to Herbert Simon: knowledge will change from meaning a noun denoting possession to a verb denoting access. •Goals and schedules adjusted to each company. When establishing a single product for the course, objectives and work planning are common for all companies. In our case, the requirements and levels of complexity of each company were different (within an average range), which depended on the product and the group of students. This situation demands that the objectives and schedules should be adjusted to the conditions of each group. In spite of the difficulties that this variety of cases might entail, we believe that it simulates more closely the global and complex reality (Morin, 2002) that students in training will face in the real world. RAIS, in its conception, seeks to reproduce from the classroom this reality ‘from the outside’ showing that any aspect of this ‘outside’ reality implies a context of its own, which can and should be approached from different perspectives. Those different final products per company and their manufacture in a real tangible product are one of the enhancements that RAIS offers against other recent strategies (Costello, 2016). On the other hand, the contextualization and relevance of the process of study, design and elaboration of the product, and consequently, the way of constructing knowledge, is another important adaptation to highlight in our work. •Broader interconnection of knowledge from other disciplines. As a consequence of the previous point, the variety of products and fields of application generated a greater wealth in contents and extracurricular knowledge. The interaction between groups during the development of the process, and the final presentation of the projects, allowed all students the access to this wealth of knowledge. We believe that through this way of implementing RAIS, students can form a broader and global vision of the scope and usefulness of the knowledge acquired, and therefore, will have the opportunity to practice reflective thinking (Barell, 1984) and to establish greater relations of meaning that promote the positive modification of their behavior and attitude towards professional life. Reflective thinking asks for using and relating information as direct resources to search of meaning. •Strengthening skills and competencies for experimental laboratory work. The particular nature of the knowledge area of Chemical Engineering offers the possibility of developing both cognitive and procedural aspects related to the transformation of raw material into products of greater value, utility and versatility. The experience at the undergraduate level, of developing a product based on technical specifications, in a set time and as a result of a laboratory procedure, is an ideal scenario for learning and for experiencing the entrepreneurship practices. In this ‘controlled’ environment, it is possible to promote the specific development of skills and competences, to encourage self-confidence, to strengthen decision-making capacity and teamwork abilities in practical laboratory work. This learning will have a positive effect on the future performance of students in all kinds of jobs, especially those involving practical laboratory or production work in a company. •Promotion of a healthy and proactive digital culture within the framework of the ICS. As a final part of the work plan for obtaining the product, the publication of the completed project of each of the companies with completely free access on the Web was established. Information and Communication Society (ICS) we are living in, promotes new ways of accessing, developing and communicating knowledge. We consider that the task of publishing the works produced by the students themselves allows them to become aware of several important aspects: (a) that they are not only information consumers, but also creators of knowledge in particular symbolic and structured forms (that counts for the symbolic distribution of cognition); (b) that knowledge must be oriented (being useful) and must be able to be applied in the resolution or satisfaction of the needs of society, otherwise it has no value to communicate it, because (c) the relation of the learner to the world must be authentic, identifying the contributions that as a citizen can offer to that world; (d) that today’s society is not restricted to the physical limits of its closest environment, but extends to the planetary community, and consequently, (e) that the solutions and proposals of ‘here’ may also be useful ‘there’, particularly nowadays in Chemical Engineering education (Álvarez-Borroto et al., 2017). The RAIS strategy was applied in several courses of the School of Chemical Engineering of the ULA, during the period 2010 to 2016. The practical implementation of the strategy was discussed in a previous work (Márquez et al. 2016). While in the present paper, we outline the fundamentals of the RAIS strategy and how it can be applied as a project-based learning strategy. In what follows we present an example of two of the products formulated in two courses, in which the project-based learning fundamentals were applied: Physical Chemistry for Chemical Engineers and Laboratory of Industrial Chemistry. The application of the RAIS strategy in both courses was oriented to obtain an experimental product by company, following the same general objective and giving a four (4) phases structure to the work. The strategies, the evaluation criteria and the number of weeks for the development of the whole tasks are similar in both experiences (Table 2 in Márquez et al. 2016). Physical Chemistry for Chemical Engineers is a key course in the basic and applied training of the Chemical Engineer, it integrates the subjects of Solutions, Phase Equilibrium, Reaction Kinetics, Interfacial Phenomena, Electrochemistry, which are the basis for the development of unit operations courses: Unit Operations III and IV and Calculation of Reactors. The objective was to obtain products that would use natural raw materials as much as possible for their formulation. The anesthetic cream based on eugenol is presented as an example of the products obtained in this course. Anesthetic cream based on eugenol. This project was aimed at developing a local anesthetic formulation based on the eugenol extracted from cloves. In order to achieve that, a high emulsion stability is required, with good appearance and pleasant organoleptic properties. In Table 1 the basic concepts and course objectives achieved by the development of this product are presented. Description of the procedure: a base emulsion formed by paraffin oil, non-ethoxylated and non-ethoxylated sorbitan esters non-ionic surfactants is formulated, in which the recommended amount of eugenol is solubilized as an oil phase for application as a topical and oral anesthetic (Cedeño et al., 2013). The Industrial Chemistry laboratory course at the Chemical Engineering School is oriented to offer the students the practice learning of a variety of organic chemistry processes such as properties evaluation of petroleum products, soap production, pectins production, as well as development and analysis of dispersed systems. Each of theses experimental experiences can be related to each other in order to give a more global approach of the chemical engineering common activities. For this reason, RAIS was applied through the creation of one big company, students were in charge of planning, coordinating and executing the manufacture of one single product in the laboratory environment. In this laboratory layout the students had the role of researchers that work for the same company and share knowledge and advances in order to get the product done. The product selected as an example for the present paper is the soap based on beeswax. Soap based on beeswax. The aim was to formulate a bar of soap from saponification of triglyceride oils of sesame oil and beeswax esters with sodium hydroxide, this soap was required to have high detergency, foamability, consistency, suitable pH and good organoleptic properties. Description of the procedure: the soap is formulated through the saponification of the mixture of 20-40% of beeswax and sesame oil. Soap is produced by the cold process, which consists in heating the mixture of beeswax and sesame oil to 60 °C until the beeswax melts, adding the sodium hydroxide in an amount calculated with the saponification index of the mixture of beeswax and oils. The soap produced is then cooled and stored for one month, during which time the cold saponification reaction continues (Marquez et al., 2015). In Table 1 a more detailed description of the new and reinforced conceptual engineering contents and objectives that are included in the different products is shown. RAIS strategy incorporates previous knowledge (from other courses), new engineering concepts (of the actual course) and contents related to the product from other specialties, which are necessary to accomplish the product implementation. Courses objectives are achieved with this strategy as discussed in a previous work (Márquez et al., 2016), which indicates that Project-based learning can be applied and integrated in Latin American university programs. This is particularly important to prepare the future Chemical Engineers for today’s entrepreneurial environment in the work field. Project-based learning nowadays is a teaching approach that is used in Universities all over the world. The instruction of Chemical Engineers in today’s Latin American Universities needs the application of strategies that promote the development of entrepreneurial skills to prepare the future Engineer to accomplish its goal: (i) Provide solutions and products to help fulfill the necessities of the community in which they live, and (ii) help society acquire better living standards by the development of products and/or services. Project-based learning has been scarcely applied in Latin American universities engineering programs and has been implemented in the Chemical Engineering School at Universidad de Los Andes for almost 10 years (Márquez et al., 2016). The results of its application indicates that Chemical Engineers that develop products through reproducing environments of innovation in the classroom, acquire entrepreneurial skills and experience in obtaining and formulating products, that helps positioning them in today’s work field.